Hamalbashian was born in Gumri. His early paintings are peaceful and quiet. They are monochromatic with no striking contrasts at all. And each work possesses its own beautiful narrative. One example of his idyllic creations depicts a woman carrying a musical instrument, a naked boy and a strange pinkish-grey animal. Another woman is seen kneeling and holding a washing bowl. The floor and the back wall are painted roughly in blue-grey, with patches of yellow, blue and a touch of pink. Under the layers of watercolour, gouache and pastel, one can see the repeated pencil strokes- betraying the rough finish. These and Sarkis’ other pre-earthquake works emanate a sense of harmony. After the 1988 devastating earthquake in Gumri and the extensive destruction of his home town, Hamalbashian’s work underwent dramatic changes. 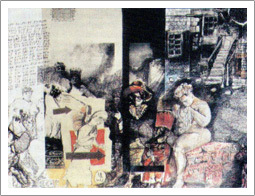 The artist’s move to Yerevan, the capital of Armenia, coincided with the transformation of the artist’s outlook and is reflected in the mode and colours of his further work. Just as Jung insisted that many artists, philosophers and even scientists owe some of their best ideas to inspirations that appear suddenly from the subconscious, a volcano of repressed emotions of enormous magnitude was unleashed inside Hamalbashian, with the possible trauma caused by the earthquake. One wonders about Freud’s conviction that the subconscious, that is to say the repressed, offers no resistance whatever to the efforts of treatment and is discharged through ‘real action’. What was repressed in Hamalbashian that burst into ‘real action’ after the earthquake? What is, for example, the red bull, one of the prominent elements in Hamalbashian’s post-disaster work? 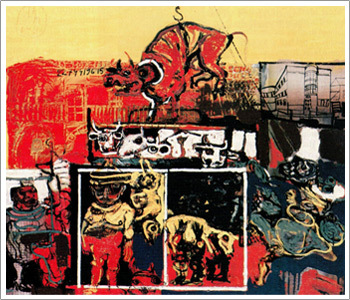 On the upper right corner of the oil painting entitled ‘Meat Market’, in an area framed in black, a building is painted in all its architectural details. A red bull is hanging from a hook. Its jaws are wide open, its tail erect, the eyes seemingly furious and the feet hang meaninglessly in the air. Below, there are white bulls in a truck. And further down, there are three frames. In one of them, it’s possible to detect the distorted figure of a big man standing close to something red, possibly flesh. In the two other white framed areas, bodies of dead lambs hang. The narrative follows from the slaughter house, painted like an architectural layout, to the deep yellow carcasses of the lamb. 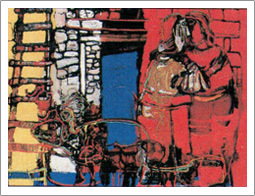 This theme is repeated in the artist’s other paintings. The reason for painting the same object for so many times goes beyond the compulsion for repetition. In Hamalbashian’s case the repetition couldn’t be an indication of a ‘masochistic excitement’, as some scholars would have it. Rather, the process of repeating the same theme probably brings the author closer to the unconsciously desirable end of the repression, or as Freud would call it, the ‘pleasure principle’ – the condition of being discharged while repeating the same expression of the repressing object – in this special case the red bull and the dead lambs, probably associated with the innocent victims of the earthquake. In February 1992 I saw Hamalbashian’s one-man show at the New Academy Gallery in London. The exhibition was distinctly divided into two parts – the soft and harmonious pre-disaster paintings and the post-disaster ones – wild and outrageous. The striking contrasts both in colours and the plot, determined the neurotic signals from the pictures. A friend of mine couldn’t stand the dominating screaming reds and yellows and the ‘poisonous’ collaboration of the colour palette and walked out of the Gallery. Nothing seemed completed on the canvases. Different plots were seemingly patched to each other. No narrative line, the peace of his early work had turned into chaos. And this process did not happen gradually but abruptly – like an earthquake. However, earthquake scenes are not directly found in Hamalbashian’s works. There’s nothing that recalls ruins or human bodies. The terror of nature has been recalled in the artist’s work indirectly only. Hamalbashian remembered that years ago his mathematics teacher disliked him for the simple reason that he loved paints more than numerals. Due to my analysis this caused a reflex of opposition and obstinacy in the teenager, and although mathematics kept submerging as a compulsory information into his subconscious, it finally found its out bursting expression in his post-earthquake work. Somewhere between Hamalbashian’s eccentric creations and the deadly disaster, lies evidence of Freud’s so-called ‘pleasure principle’. It lies in the form of hanging bulls and random formation of numbers and equations, in other words - it’s one man’s attempt to comprehend the trauma, to connect the past and present in his way and to interpret the universe with only a paint brush and a blank white canvas. ‘Each completed work is a victory for me,’ said Hamalbashian.